Our calls from the next week trade with 38.50 strike got closed for 0.05 debit right now. We are left with 37.00 puts available to be rolled. We again moved our puts from in the money to out of the money, sold new out of the money calls and collected credit doing so. Our trade is again in good shape for the next week expiration. I usually open near the money strangle and as the stock moves one direction, I close the untouched side for zero-zero-nothing and roll the touched side down (if puts) or up (if calls). So I am closing winners and roll losers and try to improve them to make them winners next time. 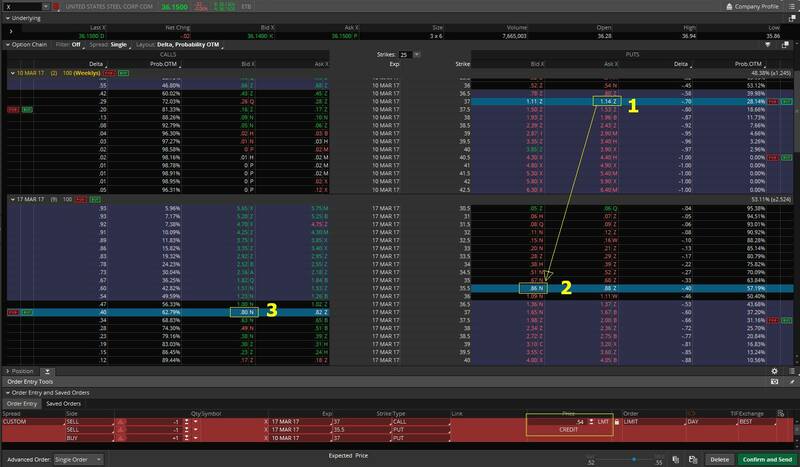 So in this trade, calls were winners (closed them worthless) and rolled puts (loser) from ITM into OTM so i improved the trade. If the stock continues down next week and the puts will again be losers and calls the winners, I will close calls for nothing and roll ITM puts down to make them OTM again. If however the stock reverses and my calls become losers and puts winners, I will reverse this process, close puts for nothing, and roll calls higher to make them OTM again (and sell new puts against it. And here is the original trade which we rolled today.